This statistic shows how often U.S. consumers eat Italian cuisine by age in 2015. 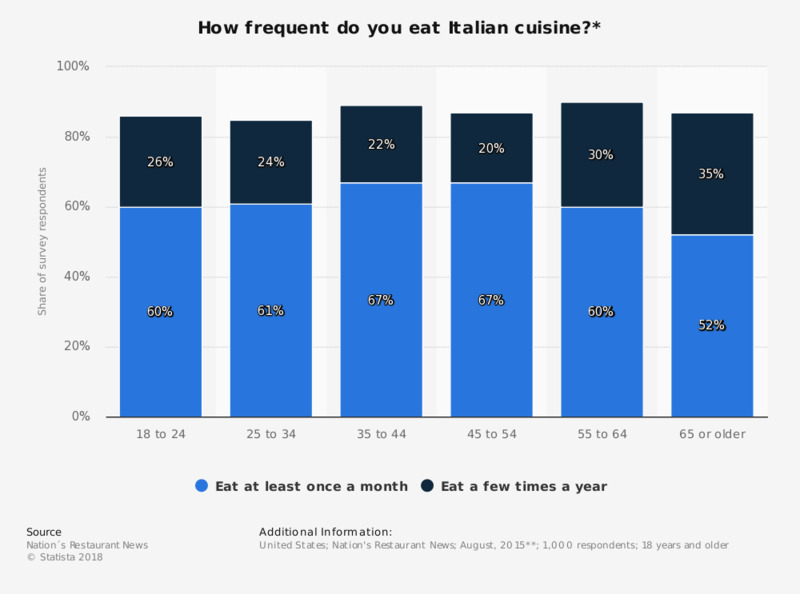 During the survey, 60 percent of respondents aged 18 to 24 said they eat Italian cuisine at least once a month. *The source does not provide the detailed information regarding the question. The wording chosen here might therefore differ slightly from the wording of the survey. The source does not provide information on method of survey. ** The date of survey was not provided, the date given is the publication date of the source. Everything On "Ethnic foods" in One Document: Edited and Divided into Handy Chapters. Including Detailed References. United States: Which of the following types of meals do you love to eat? Thinking of food now, if you had the choice to go out to a restaurant and eat one type of food, which of these are you most likely to choose? How important are each of the following when you choose to eat at a specific restaurant?